I’ve written before about why Memorial Day shouldn’t be confused or conflated with Veteran’s Day — and I am hardly the only person to draw attention to that distinction (Washington Post: Why Memorial Day is different from Veterans Day, CNN: Get it straight: The difference between Memorial Day and Veterans Day, Washington Examiner: Why you shouldn’t confuse Memorial Day and Veterans Day NPR: Memorial Day Dos and Don’ts. Flowers from Mom, my sister, and I on the grave this year for Grandma and our step-grandpa. 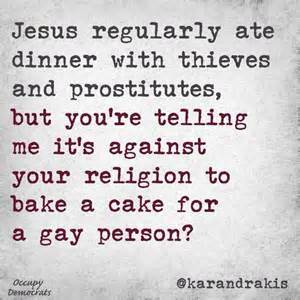 Some of those articles mention the original holiday, but they get one bit wrong. 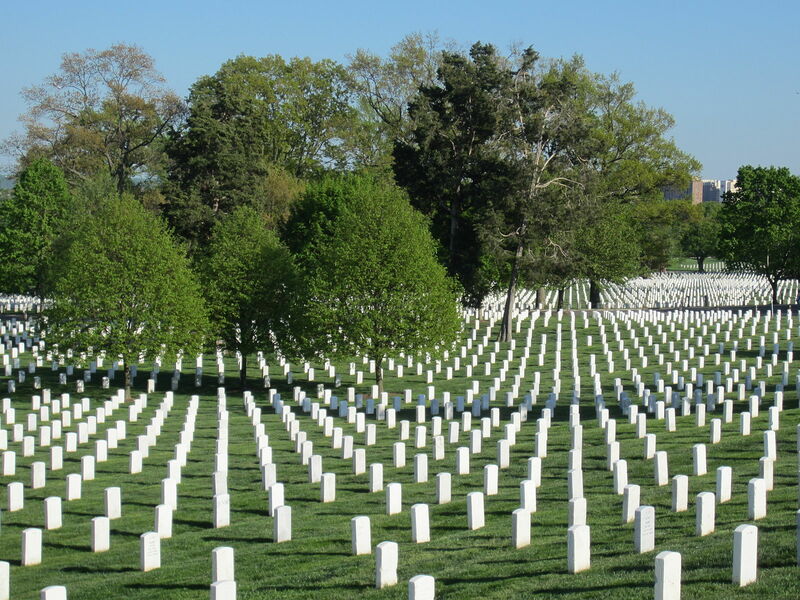 Before the first official federal observation of a Memorial Day, at Arlington National Cemetery back in 1868, there was another holiday observed in many parts of the country—long before the Civil War—called Decoration Day, which was a day to have family reunions and celebrate the lives of all of our deceased family members. 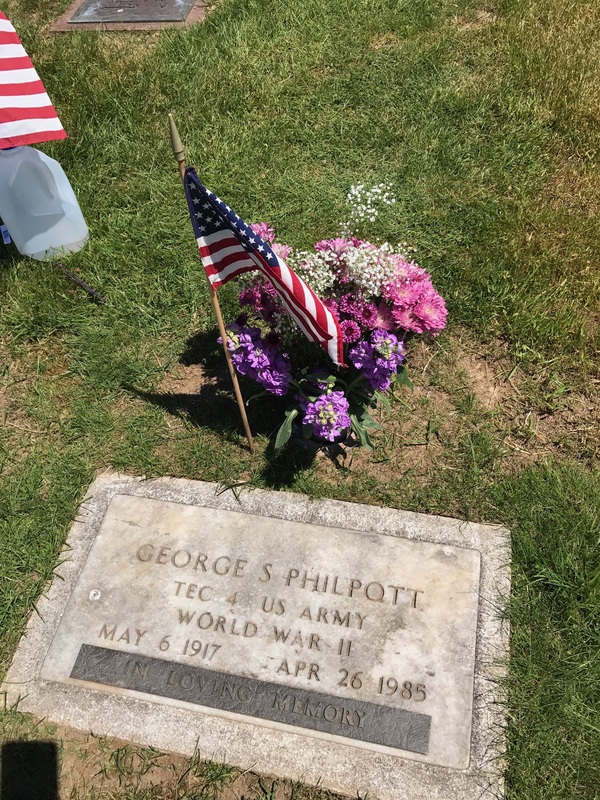 My Grandmother observed that version faithfully her whole life, long before the official creation of the modern Memorial Day with the Uniform Monday Holiday Act of 1968. Grandma died exactly ten years ago last week, and it still hurts to think about. 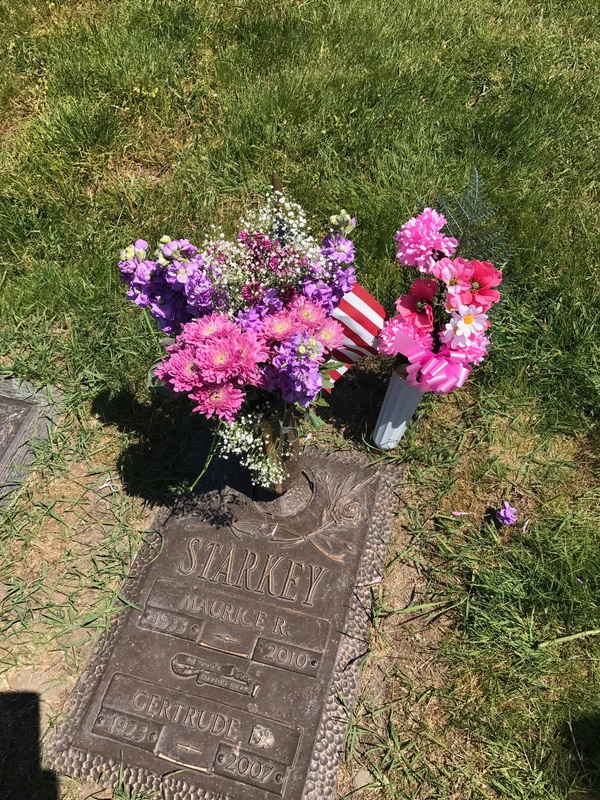 The fact that she was putting flowers on the grave of another beloved family member when she died just makes me even more of an adamant defender of the original, non-jingoistic, non-warmongering version of the holiday. But rather than rant about that, I should post about my grandmother, a wonderful woman who taught me so much. 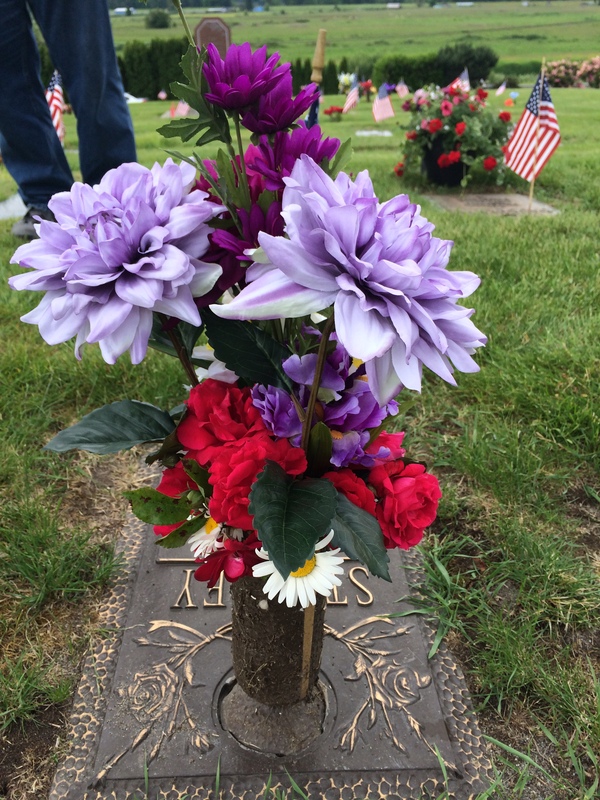 Flowers from Mom and I on Grandpa’s grave this year. 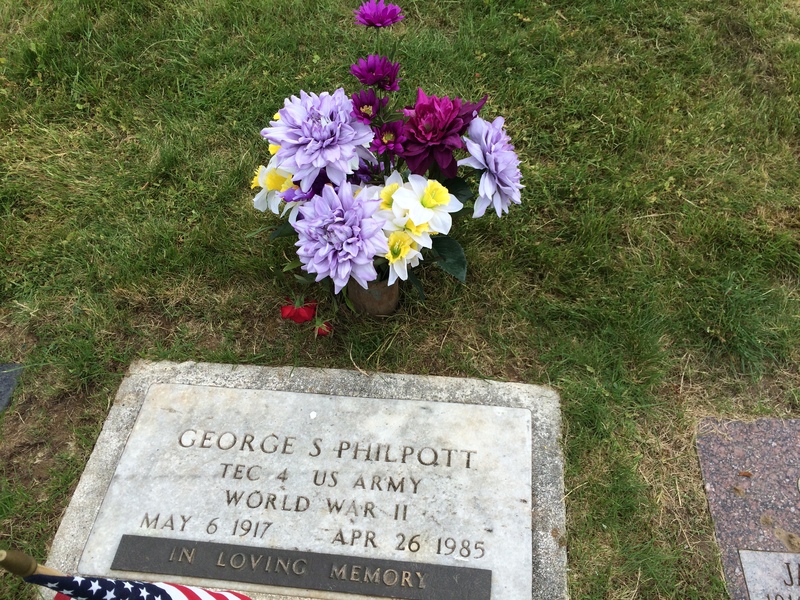 And if you are one of those people offended if I don’t mention people who served our country in the armed forces on this day, please note that we also put flowers on my Grandpa’s grave. Grandpa served in WWII in Italy. He didn’t drive a tank, he drove the vehicle that towed tanks that couldn’t be repaired in the field, and one of the two medals he was awarded in the war was for doing a repair of a tank while under fire. After the war, he came back to the U.S., met Grandma (who was at that point working as a nurse and trying to support her two daughters), and eventually married Grandma and adopted my mom and my aunt. Many years later, he was the person who taught me how to rebuild a carburetor (among other things). 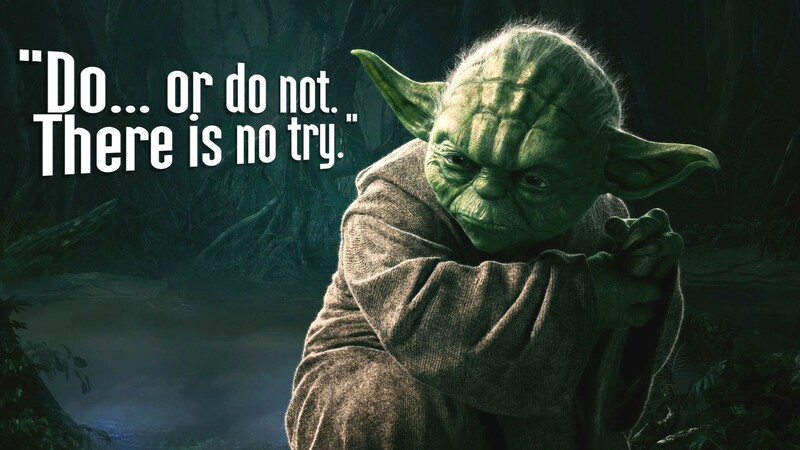 He was a hero many times over. And this post is also dedicated to his memory. My copy of Funk & Wagnalls is a 1969 edition. In 1875 Isaac Kaufmann Funk started a publishing company. Two years later one of his friends from University, Adam Willis Wagnalls, joined the firm as a partner and they renamed the business Funk & Wagnalls Company. For the next 13 years they published mostly religious books, but switched to reference after the success of their The Standard Dictionary of English in 1894. This eventually led in 1912 to the publishing Funk & Wagnalls Standard Encyclopedia. Funk also had a passion for accurate phonetics. They published an updated and expanded two-volume version of the dictionary, called the New Standard Unabridged Dictionary in 1913, which they continued to update with new editions until 1943. 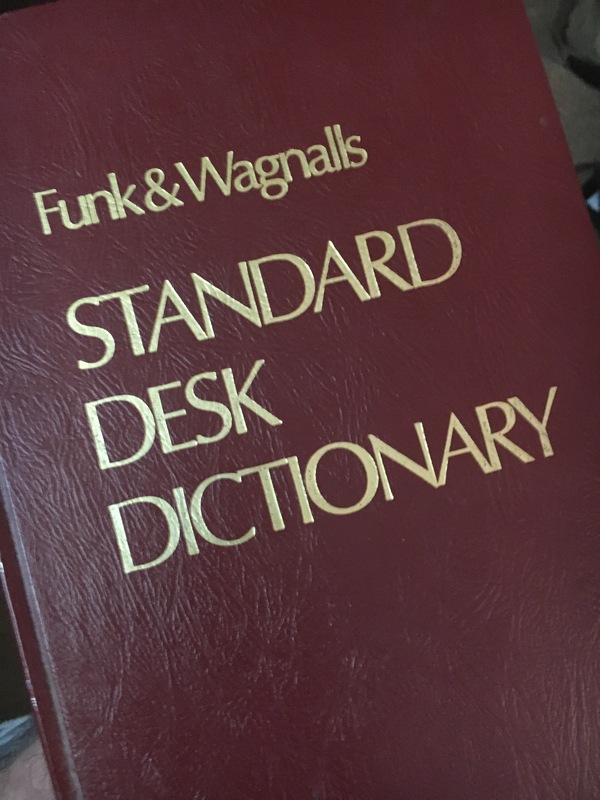 The Funk and Wagnalls Student’s Standard Dictionary of the English Language was first published in 1920, then Funk and Wagnalls New Practical Standard Dictionary (another two-volume set) from 1946. 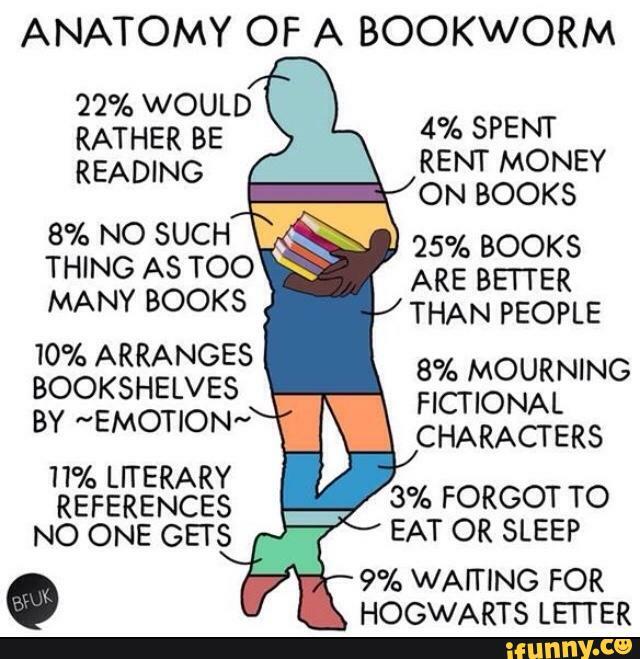 Not to mention various specialty dictionaries. They became a household name (as it were) when in 1953, in a deal with Unicorn Press, the encyclopedias started being sold in grocery stores. Not the entire set at once, mind you. No, each week a new volume became available. Volume one sold for 99-cents and subsequent volumes where $2.99 a piece. If you remember to go to your local supermarket every week, in just four or five months you could have the entire encyclopedia. The encyclopedias continued to be sold that way until some time in the 1970s. But what really put Funk & Wagnalls on the pop culture map were some kings of television comedy in the 1960s. 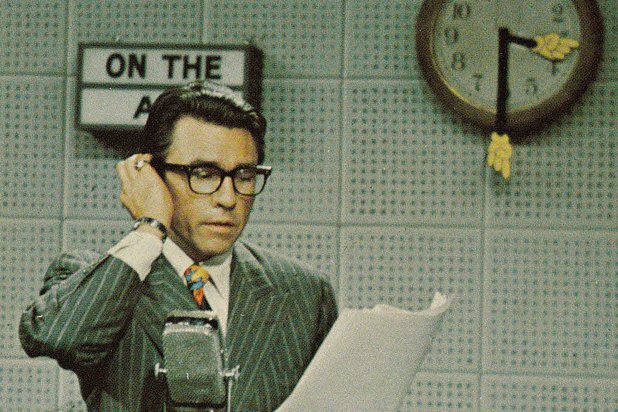 Johnny Carson appears to have been the first person, on his nightly Tonight Show to occassionally use the name of either the Funk and Wagnalls encyclopedia or dictionary in various jokes where he would allude to the f-word or other sexual matters without getting in trouble with the network censors. But things really took off when it became a running gag on Rowan & Martin’s Laugh-In. The catch phrase, “Look that up in your Funk and Wagnalls” was a running joke, as well as other references to the publisher’s awkward to pronounce name to allude to sexual topics. There is also the much repeated story the Jerry Garcia got the idea to rename his band, The Warlocks, as the Grateful Dead, because he found the phrase while thumbing through a Funk & Wagnalls dictionary while smoking dope with a bunch of friends. For a long time Garcia’s story was considered a misremembering, as no one could find an entry for grateful dead in the editions of Funk and Wagnalls standard dictionaries. Finally, someone found a copy of The Funk and Wagnalls New Practical Standard Dictionary, Britannica World Language Edition whose editorial board had included the chief editor of the Dictionary of Folklore, Mythology, and Legend. The 1955 Britannica World Language edition included a number of terms from folklore and mythology that don’t appear in any other edition of Funk and Wagnalls standard dictionaries. I think I first saw the Funk & Wagnalls encyclopedia during one of the grocery store promotions, though I also remember the two-volume dictionary set being owned by my paternal grandparents. Funk & Wagnalls never became as famous (nor was considered as definitive) as the Merriam-Websters or Oxford dictionaries, but they were good reference books. And the idea first popularlized by Isaac Funk that the dictionary should focus first on current usage, was eventually adopted by more famous dictionaries. That isn’t a bad legacy. And if you don’t know what I mean by legacy, well, you can look it up in your Funk & Wagnalls! A recent Tumblr post reminded me of one of the reasons that people who aren’t packrats don’t understand packrat behavior. Packrat behavior is sometimes clinically defined in terms of controlling anxiety. The biggest anxiety in question, and the one we mention least often, is economic anxiety. And the thing about economic anxiety that is most misunderstood is that it is not irrational. This really locked into my brain when I was reading one of the declutter your space things and it suggested getting rid of duplicate highlighters and pens. /Pens/. It suggested that you needed one or two working pens, so if you had extra you should get rid of them. That was when I realized minimalist living was /innately/ tied to having spare money, because the idea was, of course you just went out and bought the single replacement thing whenever the first thing broke. You obv. Had the time and money to only ever hold what you needed that moment, because you could always buy more later. 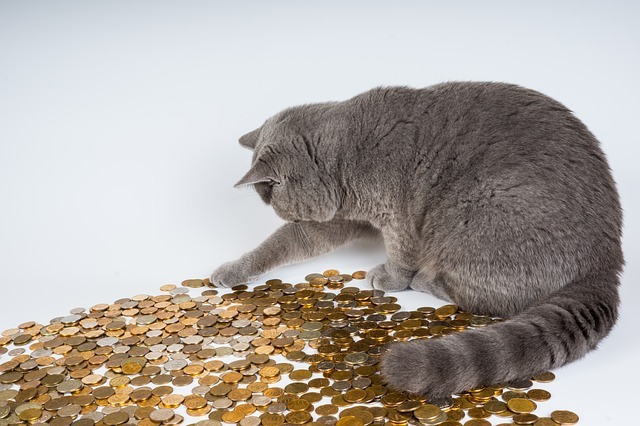 There were several years of my life when every single dime of every paycheck was already allocated before I got it. This wasn’t because I was bad at money management or because I was living above my means (at least not the way that people who like to throw that phrase around use it) or because I was lazy, it was because I made very little money, period. I was attending college part time and working three jobs (three jobs). My mom was working full time (when for health reasons she shouldn’t have been working at all), lived in another state, and was trying to support my younger sister. My parents had been divorced for years at that point and one of my dad’s least awful behaviors was that he absolutely refused to even fill out financial aid forms for any of his five children, let alone send any support that wasn’t ordered by a court. In that situation, any unexpected expense—no matter how small—meant skipping at least one meal during that pay period. I’m not exaggerating. At least half of my meals at the time were things like cheap boxed macaroni and cheese. Not the “expensive” kind with a picture of orange sauce-slathered pasta on the box. I’m talking the plain white box with black block printing that sold for 20-cents a box (and about four or five times a year would go on sale for 10 boxes for a dollar, so you’d buy five bucks worth when it did because that meant you had a cushion in case of an unexpected expense later). And a good portion of my childhood was spent with our family living like that. I talk about the bullying in school, but that wasn’t the only horror that school sometimes visited upon me. You don’t want to know the terror and humiliation that comes over a kid from a struggling family if you are informed that this next assignment requires your parent to buy something unexpected. Or that there is a $10 fee required for this class activity that is part of your grade. So, yes, when Michael and I were loading the last of the Christmas decorations out of the storage space at our old apartment this weekend and I discovered yet another old monitor that we had wrapped up and stashed when we replaced it years ago, I felt a bit of embarrassment, because that meant we had a total of six old monitors to get rid of, instead of the two that we had thought just a week ago. But another part of me knew why it was there. Because things break. You have the money now to buy that new monitor you’ve been pining after for months, and you’ve double-checked, triple-checked, and quadruple-checked your bank accounts and all of your bills for the next few months before spending the money (because you always do that before spending money), and it’s nice and pretty and so much better than this old thing you probably should have replaced a year ago. But you do not, repeat, do not dispose of the old monitor. You don’t donate it to charity. You sure as heck don’t throw it away! You put it away, because if some disaster happens and your shiny new monitor gets fried when lightning strikes your building (it happened to my ex- years ago, one lightning storm and half of her electronics were fried) or whatever, you can pull that old monitor out of the basement and keep working for however long it takes to save up to buy a replacement. Yes, sometimes when we replace an appliance or a computer part or accessory, we will pass it on to a friend we know needs it. But the reason we are able to do that? Is because we know that we still have the older one that we replaced four years ago in storage, so if something goes wrong for us, we have that back up. It doesn’t matter that for years I’ve been lucky enough to have relatively stable employment and the wherewithal to cover my bills without worrying about skipping meals if a tiny unexpected expense comes up. It doesn’t matter because I know I’ve had to live that way before, and I know that it could happen again. It isn’t about an irrational fear or lack of planning. There are checklists in the back of my mind all time: do we have enough food in the cupboard to make meals for the next couple of weeks? Do I know which bills I have to pay in the next two months and the approximate total to cover them? Is the gas tank on the car full? Did I pay up the Orca card so my bus pass will work for the next two weeks? If the microwave or stove break do I have an alternate/backup means to cook until we can get something replaced or repaired? And yes, if my pen runs dry when my rent is due, do I have backups so I don’t have to make time to go buy a replacement before I can write the rent check and hand it in on time? Those aren’t silly, or paranoid, or stupid fears. My living spaces haven’t been cluttered my whole life because I have a sloppy mind. 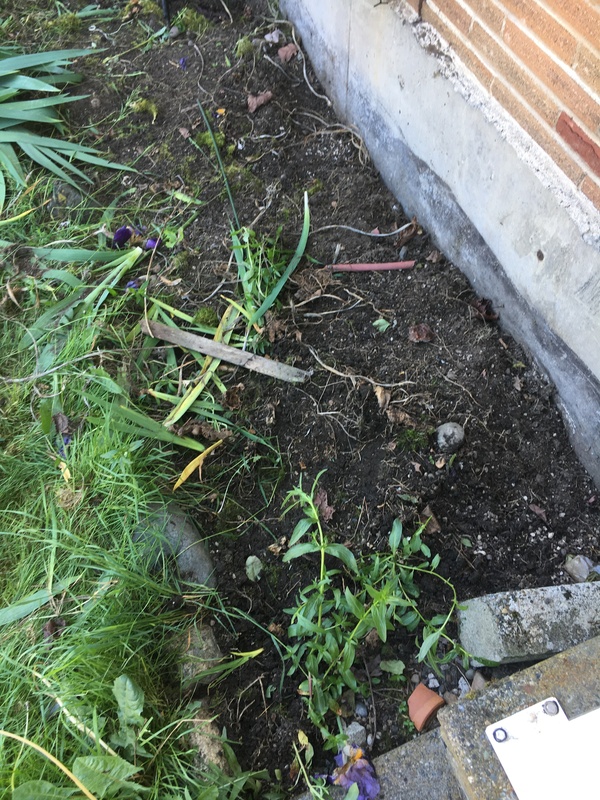 I understand that there are hidden costs to the packrat behavior. I know that storing all these extra things is using up space that could be used for something else. Packing items super tight into every available nook and cranny means you have to spend more time later looking for something. It can mean that you aren’t aware of a physical problem with part of the house because you can’t see that back wall over there and don’t know that some water damage happened because the neighbor tried to fix a sink themselves rather than call a professional, and they cleaned up their side, but not before some seeped through to your wall. And I right now I am hyper aware of how much extra time, effort, and money it takes to move (or sort through and dispose of) all that extra stuff that I’ve been storing all this time. Knowing this makes it a little easier for a time to tamp down that chorus in the back of my head that speaks in the voices of my grandparents and great-grandparents about not getting rid of things that we might need some day. The truth is that the chorus isn’t wrong. 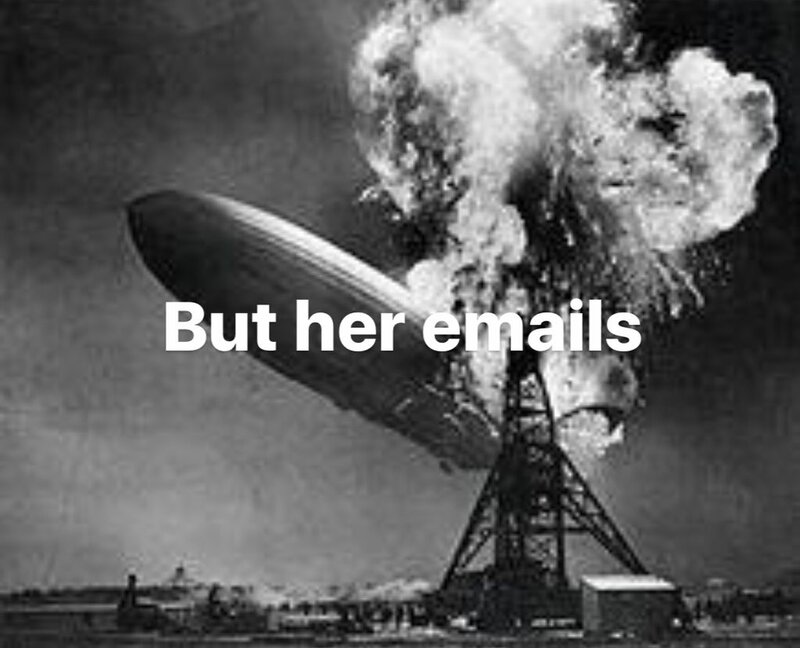 We might need that some day. I say this because I don’t want my recent self-deprecating comments about my packrat tendencies to be taken as justification to upbraid anyone for being a packrat. It’s one thing for me to decry my own issues, but it’s important to remember that the “ideal” uncluttered minimalist lifestyle is a product of economic privilege that not everyone has. 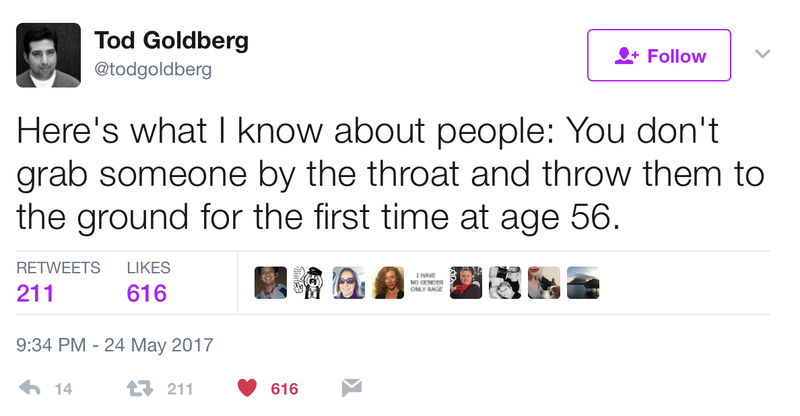 Scolding someone for not being able to achieve it is just as wrong-headed as blaming young people for not owning a house on the occasional purchase of avocado toast. 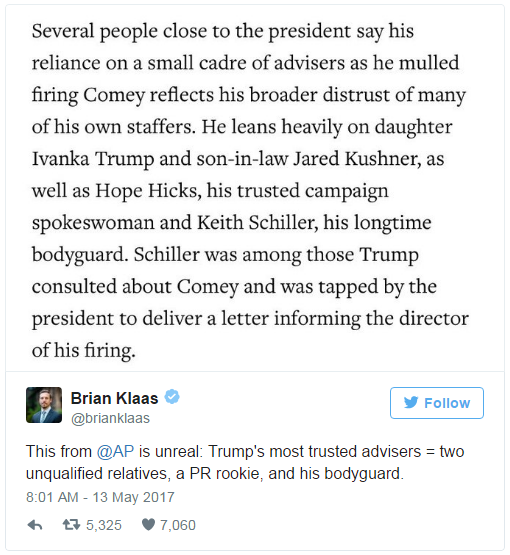 The Associated Press article being quoted in the above is available here: FIRESTORM OVER COMEY’S DISMISSAL ADDS TO TRUMP FRUSTRATIONS. “Tell him is fake news. 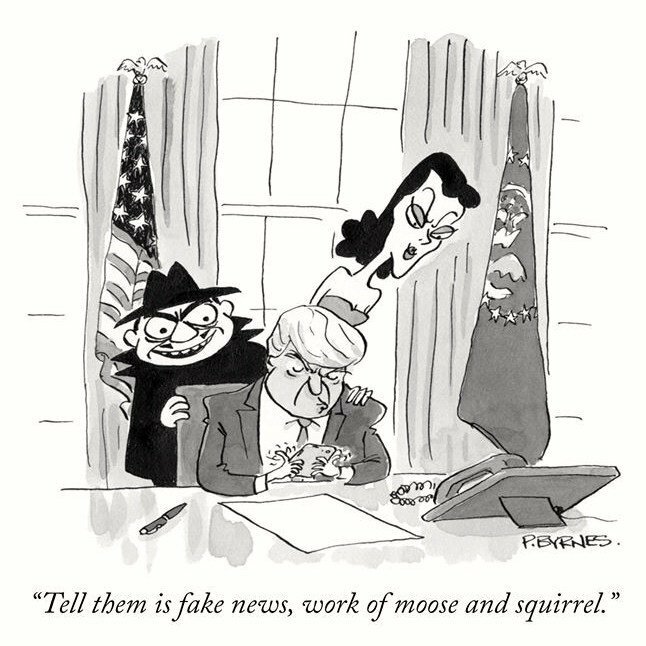 Work of moose and squirrel.” Cartoon by Pat Byrnes from the New Yorker.